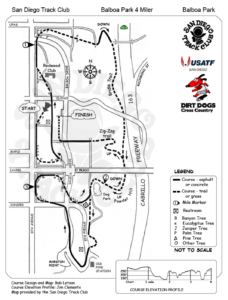 RACE COURSE: Start and Finish are north of 6th and Laurel in Balboa Park. 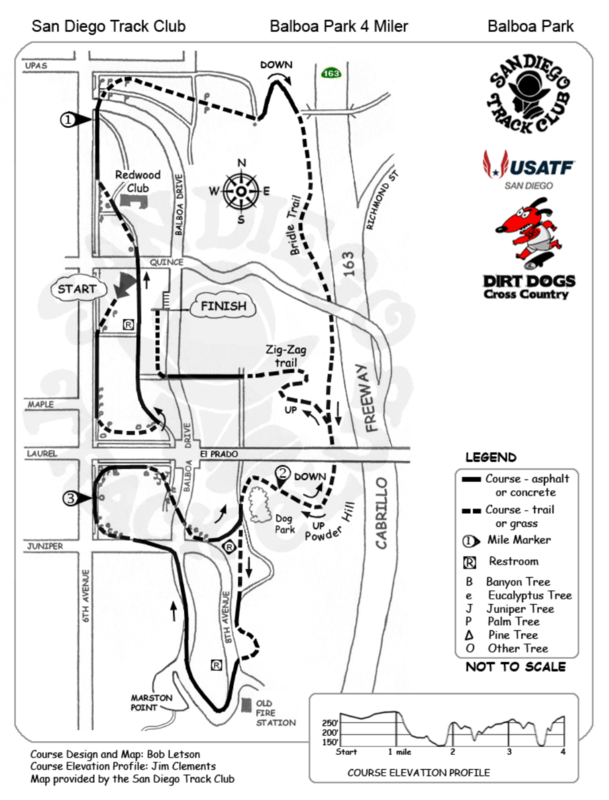 This is a challenging race on trails, grass and sidewalks. DIVISIONS: Female and Male in each category – 12 & under, 13 – 18, 19 – 24, then 5-year age groups up to 80 and over. EARLY REGISTRATION fees: 18 years of age and under $10, SDTC Members $15, Non-Members $20. Mail entry form & check no later than 8/26/17 to “Contact” address below. RACE DAY REGISTRATION FEES: 18 years of age and under $20, SDTC members $25, Non-Members $30. We don’t have one up yet, but look again as we get closer to the race. It is a tough one. Map is posted. Hope to see you there. What time does packet pickup start on race day, and where? Where do you suggest for parking? Bib pickup is likely at least an hour before the first race. Parking is easiest outside of the park on 6th or the surrounding neighborhoods. It’s not a huge race, so finding a spot is not normally an issue. How much is trails, and how technical are the trails? About half of the race is trail. You can see it called out on the map. Most of it isn’t too technical though there are some hills thrown in there. Packet pickup will be the morning of the race. We can sign up in the Am to? I got out of work late and missed the 5pm deadline. There was a photographer on the final hill. Does anyone know where he posts his pictures? Thanks! We’ve got a bunch from one of the SDTC members that we’ll get up soon. He was at the top of Zigzag hill so that might have been him. Thanks Jessie! The sun was rising through the trees perfectly so I bet there are some gems in there!